We are located on the east end of the Medical Center Campus at 25 Hope Drive. We are directly across the street from the new 30 Hope Drive medical building. Our building is marked 35, and we are located in the single story section of that building. If you need extra help getting to us, please don't hesitate to call at 533-2002. Travel West on Rt. 322. go straight through the lights on Cocoa Avenue/Rt. 743 and Hockersville Road. At the next light turn left onto Cherry Drive. (Karn's Food Market will be on your left.) Make your first right onto Hope Drive and then take your first right at the stop sign. Make your second right into the parking lot for the Mohler Center. Travel East on Rt. 322. Drive past the Hershey Medical Center (on your right) to the Cherry Drive traffic light. Turn right at the light onto Cherry Drive. (Karn's Food Market will be on your left.) Make your first right on Hope Drive and then take your first right at the stop sign. 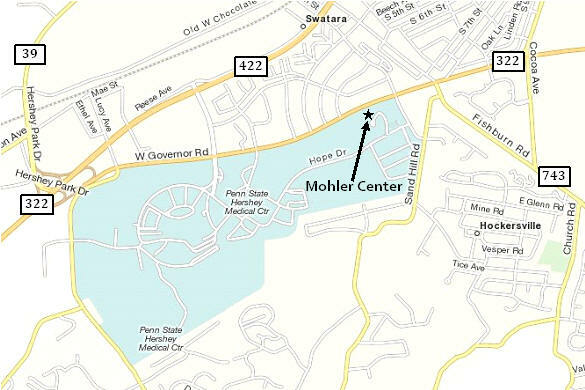 Make your second right into the parking lot for the Mohler Center.